We’re supporting International Stop Pressure Ulcers Day, November 15 2018. Our healthcare professionals who work in Barnsley communities will be talking to patients, families and members of the public about how to prevent pressure ulcers. A pressure ulcer (sometimes called a bed sore or pressure sore) is when your skin and underlying tissue gets damaged by unrelieved pressure causing a painful sore. Tim Breedon, director of nursing & quality, said: “The ‘Stop the pressure’ campaign aims to renew visibility among healthcare professionals and the public about the damaging impact of pressure ulcers and the benefits of prevention, particularly as we head into another challenging winter. Despite the best efforts of NHS staff, we are still seeing more than 1300 new pressure ulcers a month nationally, at considerable cost to the NHS. Evidence indicates that the majority of pressure ulcers are preventable and could be avoided through simple actions. As well as causing long term pain and distress for patients, treatment is estimated to cost the NHS more than one billion pounds annually. There is a good strong evidence base on how to prevent pressure ulcers from developing, the majority of which is simple to understand and easy to do. Family members who are looking after elderly relatives at home should be encouraged to learn about pressure ulcers and how they develop. By knowing about the various things that will put someone at risk you will be in a far better position to be able to help prevent a pressure ulcer from occurring. 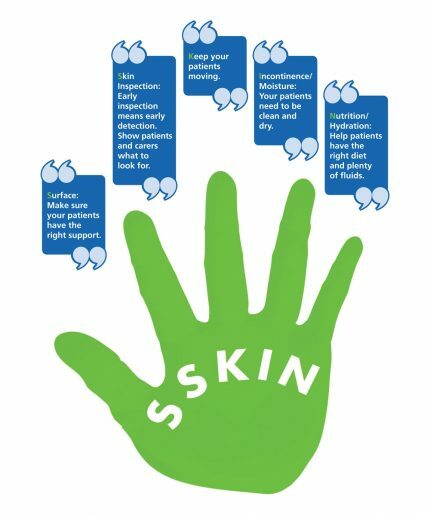 S – Skin inspection: check for colour changes, blisters or swelling in areas which are vulnerable. K – Keep moving: Encourage gentle movement frequently – chair based exercise will help to encourage circulation and alleviate pressure from the key areas. Encourage movement forward and backwards, left to right in a seated position with feet flat on the floor. I – Incontinence: is this deteriorating? If the person at risk is incontinent then make sure a proper plan is in place and that barrier creams are being used as directed after washing and drying the skin. N – Nutrition and hydration: is the person taking on adequate food and drink? If not is there a problem that can be easily rectified (sore throat, mouth ulcer, broken dentures) or do they need to see a doctor?